In my office at home, there is an old oak desk. It sat for many years in my grandfather's office. After he passed on, it sat in my sister's house for many years until she gave it to me. I finally decided to refinish the old desk, and make it look more respectable. After carefully stripping away over 80 years of accumulated grime and varnish, the old oak desk revealed its beauty once again, and I marveled at the glow of the newly found wood. The top had been marred by the years of daily use, so I carefully began to sand it smooth. 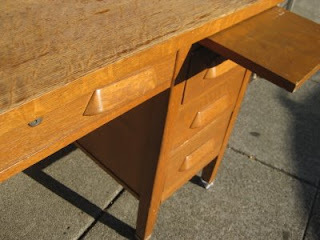 There were many deep scratches and nicks that testified to the use and abuse that the old desk had endured. Moving finally to the right rear corner, I saw a faint mark and bent down to examine the damage. Catching the light, I saw two faint initials, "CY". "CY" was Carl, one of my father's three older brothers. He had grown up, gone off to war, fathered five children, and retired as a vice-president of a large oil company. He had truly made many more important marks in his life. I had buried my father three years earlier, and my uncle Carl had passed away five years before that. Their father had been gone for over twenty years. But in that single instant, all their memories came flooding back to me. I can only imagine what was going through my uncle Carl's mind that day long ago in his childhood when he made his mark on his father's big oak desk. I'm sure that his father gave him a stern lecture, and probably inflicted a quick swat to his behind. There may have even been a missed dinner imposed. But the initials were never removed. By the time I came along, there was a thick sheet of glass covering the top of the old desk, which prevented further damage to a well worn top. The old oak desk survived my grandfather, grandmother, and all four of their sons. They are all gone, but here was this old desk, reaching across the years to remind me of a time when they were young, and suddenly I connected with the family long gone. Gone, but still teaching me the ways of fathers and sons. To bring them back to me.